Kevin grew up in Cork, where his mother and father raised him and eleven siblings with an iron fist. Kevin grew up studying Proust, Joyce and classical music, but as soon as he finished secondary school he ran off with a group of gypsies, hoping to find happiness outside of his intense and disciplined household. Kevin eventually found his way to America on a large ship called the HMS Leprechaun. Originally settling in the Southie neighborhood of Boston, Kevin was accepted to the Harvard MBA program and awarded the 'Guinness scholarship' reserved for top Irish business students. A chance encounter with Bruno Delavigne at a nightclub landed Kevin an interview in San Francisco, leading to the position of production manager, where he has flourished. 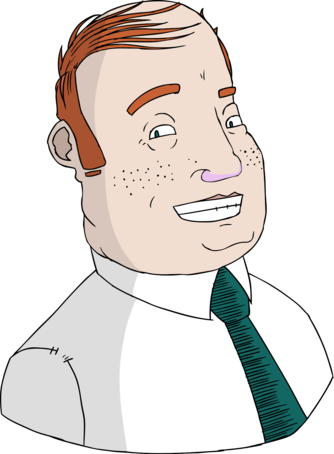 Kevin is a reassuring presence at the office and is well-liked for his good humor and funny stories, especially tales of his comic misadventures. Kevin enjoys beer, travel and family, in that order. It's a business trip, I am a businessman, so I decided to go business class. Doctor, you'll be using anesthetic, won't you? -Ana what? With three aunts and four uncles, I have a total of thirty-seven cousins. Kevin was Ireland's Junior National fiddle champion in 1982. Kevin is notoriously stingy, and his been known to search for loose change in phone booths, sofas and candy machines. Kevin's parents hold a family reunion in Dublin every 5 years where more than 300 members of the Connors family are reunited. Connors travels frequently to Asia and the Pacific Rim where he negotiates with Delavigne's Asian production partners. Kevin has developed a close friendship with IT assistant Jean Marron, with whom he eats lunch frequently.